Wastewater is a by-product of domestic, industrial, commercial or agricultural activities. Eutrophication is a result of the discharge of nitrate or phosphate-containing detergents, fertilizers, or sewage into an aquatic system. when a body of water becomes overly enriched with minerals and nutrients that induce excessive growth of plants and algae may result in oxygen depletion of the water body. At a global level, 80% of wastewater is discharged into the environment untreated, causing health issues. Billion of people lack access to an improved drinking water supply which is a serious cause of diseases. The goals of the treatment are to remove unwanted constituents in the water and to make it safe to drink. Iron Fe nanoparticles can be effectively used to treat several forms of ground contamination. Since 1990’s Fe-NPs have been used for site remediation and treatment of contaminated water due to their reactivity of surface sites. The green synthesis of Fe-NPs using extracts of natural products has emerged as a simple and cost-effective. Fe NPs have also been synthesized using green tea leaves but are economically expensive. In the present study, iron nanoparticles are synthesized using extracts of eucalyptus leaf, which is abundantly available in Fujian, China. To evaluate the reactivity of the as-prepared EL-Fe NPs, wastewater was taken from livestock and poultry breeding industries contains a large amount of nitrogen and phosphorus both of which were the main elements eutrophic water. Proper treatment of such wastewater is necessary before they can be discharged into natural water. 7% of total N, 30.4% of total P was removed. The conclusion of the whole article is the method used for synthesis was Simple and efficient. 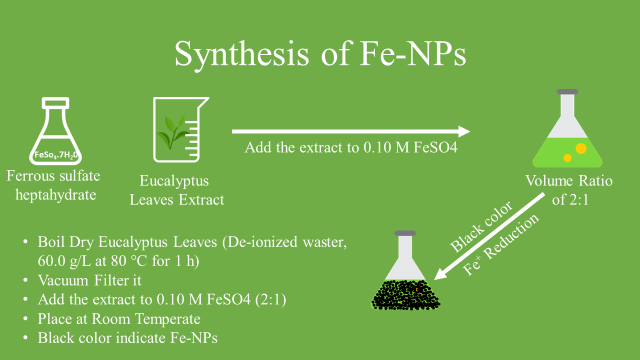 The method can be used at room temperature, Biodegradable and non-toxic .eucalyptus leaves used contain antioxidant and Polyphenols reduce the aggregation of Fe NPs and enhance their reactivity. This post is co-authored by Khoula Malik & Wajiha Jahangeer. 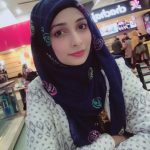 I am Arooma Ihtisham M.Phil Scholar of biochemistry at COMSATS University, Islamabad. My interest area in research is Biochemical pathways, Nanobiotechnology and genetics.